These handcrafted jewellery designs are inspired by the sea shells washed up by the surf at Llangennith beach, Gower. LLangennith is renowned for its crashing, tumbling surf and long sandy beach, the ebbing tide leaves behind a gallery of driftwood and vacated shells. Tumbled tubes of stiffened sand and starfish scatter the bottom of tidal pools and rippled sandbanks. Gulls peck at the sand to feast on the pipis shells at low tide. A solid 9ct gold baby whelk shell is complimented by a superior quality real black or white pearl suspended on a 16 inch 9ct gold snake chain 1mm thick(3.2g). This is a contemporary design for those of us who prefer the warmer tones of gold. 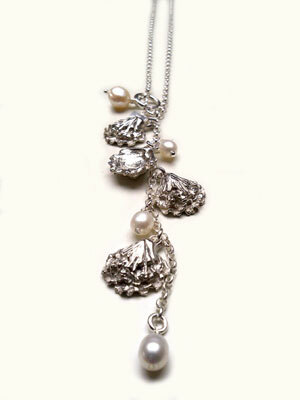 This silver chain hosts a variety of natural coloured aquamarine, real pearls, silver whelk shell, cockle shell, limpet shell, mussel shells and starfish charms. 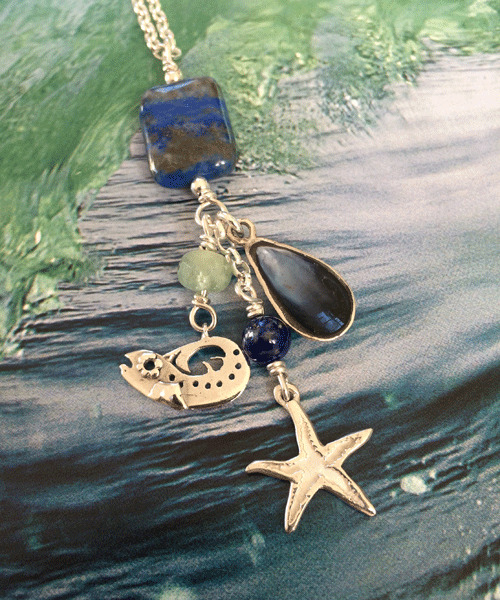 These charms are inspired by the the tumbled sea shells that are left at the shoreline at high tide. click on image to enlarge. LL3 Llangennith silver shell Collection. 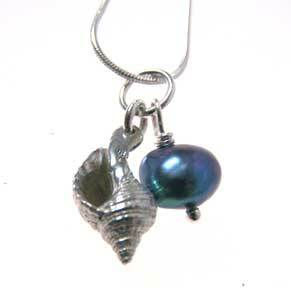 This unique silver pendant hosts a playful silver bass, baby silver set mussel shell and starfish charms. The pendant is coloured with a watery blue aquamarine, square and round lapis lazuli beads. 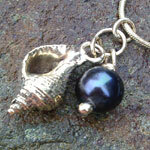 Silver oyster with black pearl on a silver chain pictured right. LL4 Llangennith silver shell Collection. 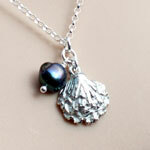 Silver baby whelk shell and real black pearl necklace on a 16 or 18 inch chain. 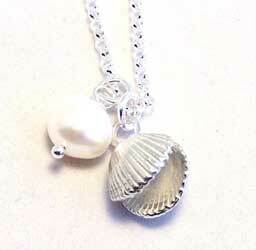 Solid Silver cockle shell with white pearl on 18 inch belcher chain. 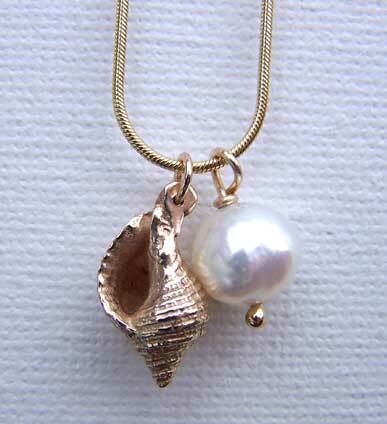 These are 9ct solid gold shell pendants on solid 9ct gold chains.